The new INFINITI Q60 is an impressive coupe available with rear-wheel drive or all-wheel drive. It runs on a standard 300-hp 3.0L V6 twin-turbo engine paired with a seven-speed automatic transmission, and it features a host of exciting luxury features for a thrilling ride around San Antonio. Why Buy a New INFINITI Q60 in Boerne? The Q60 is available in three trim levels with 8.7 cubic feet of trunk space. The spacious interior offers 37.9 inches of front headroom and 43.1 inches of front legroom for a comfortable drive to and from New Braunfels. Enjoy leatherette upholstery, memory settings for the driver’s seat, a six-speaker audio system, and INFINITI InTouch™. The INFINITI Q60 makes an EPA-estimated 19 mpg/city and 28 mph/highway and provides you with a remote keyless entry system, a suite of driver-assist safety features, and more. After you’ve explored the INFINITI Q60 inventory, contact us to set up a test drive. 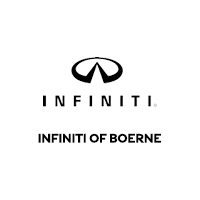 INFINITI of Boerne	29.7835702, -98.7423907.